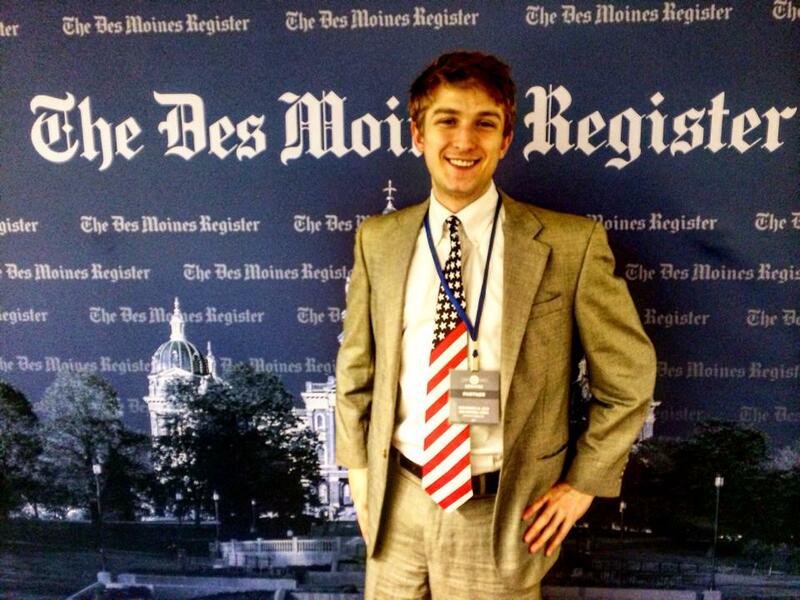 Thanks to the Des Moines Register for letting me work for them for the day! For the first time ever, I was able to be on site for a presidential debate this past weekend, and it was a ton of fun. 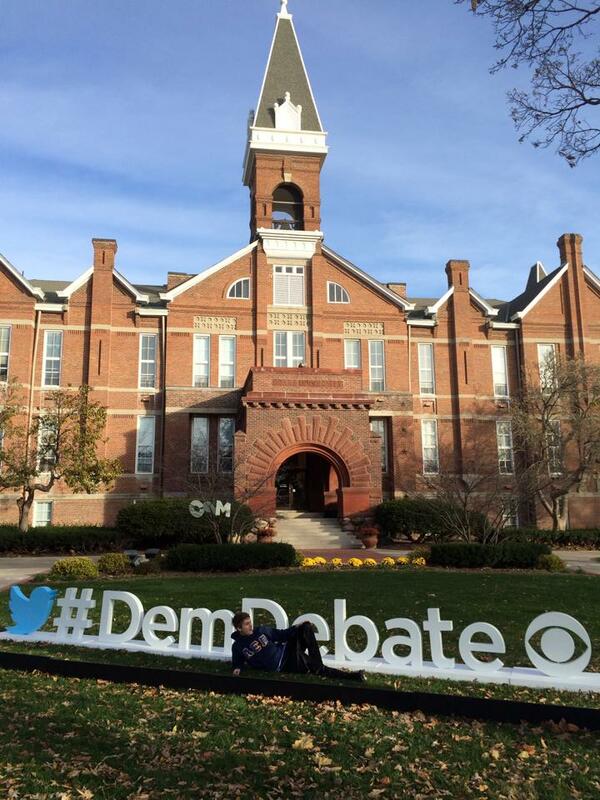 Although I wasn’t in the debate hall itself (because it was a downright tiny auditorium), there were several things on Drake University’s campus that I came across that I thought would be beneficial to highlight. They fit the whole audience in this auditorium. It’s definitely a lot smaller than the Reagan Library. It would be hard to walk across the campus and not be struck by the “Chalk Wars” that took over pretty much every sidewalk. Martin O’Malley’s campaign completed dominated. Now this is a sentence that hasn’t been typed it quite some time, but with regards to chalking the sidewalk it absolutely was true. 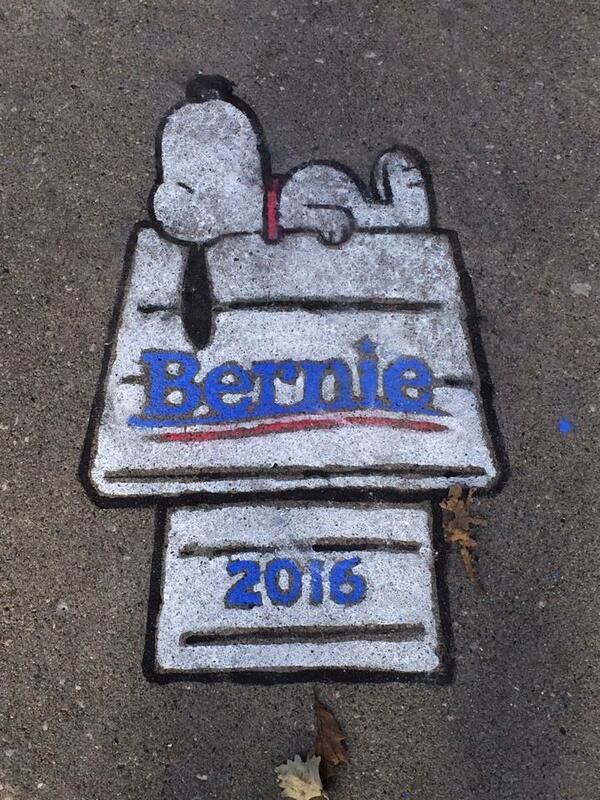 Bernie had some chalk around the campus, but O’Malley absolutely won the sidewalks. I didn’t see a single chalkmark anywhere for Hillary. Although O’Malley won the “Chalk Wars,” this was my favorite. 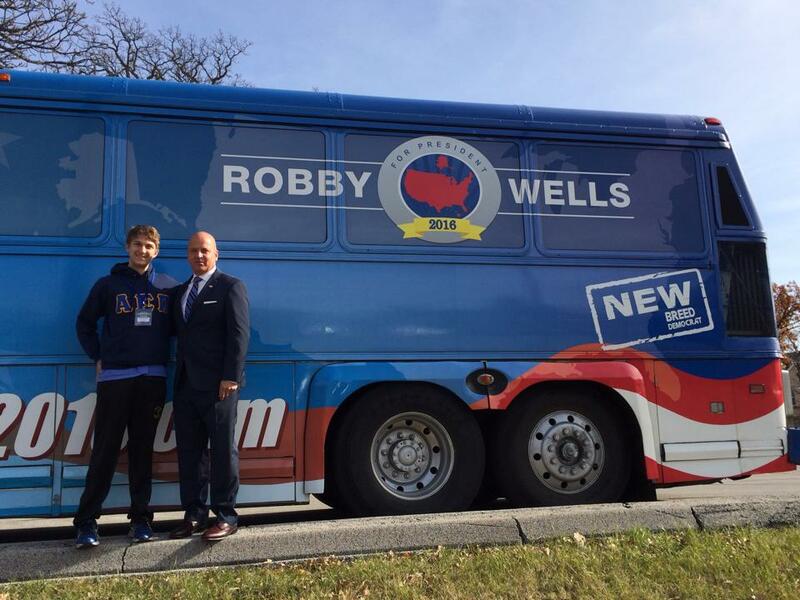 Robby Wells, who is now running for President a second time. I actually interviewed him at length and you can read about that here. Here we are post interview. A guy who rewrote the Constitution so he could have his own version of it. This debate started at 9 PM Eastern! That’s ridiculous! No wonder no one watched it, and consider that the final two debates before voting in Iowa are on the Saturday before Christmas and the Sunday of MLK Weekend! It’s almost like the DNC is doing everything in its power to minimize the exposure that Hillary has to face (DNC Chairwoman Debbie Wasserman-Schultz was a NATIONAL Co-Chair of Hillary’s 2008 campaign). In honor of the fact that I watched the debate from the headquarters of the Des Moines Register, I thought I’d add two observations that anyone watching outside of Iowa might not have caught. The first is that there were only 3 Iowa mentions that I noticed. Hillary made two and O’Malley made one. Given the importance that this state plays in the process, I would have thought that the candidates would have used this as an easy way to prove their Iowa bona fides. I guess not. Interestingly, one of Hillary’s mentions of Iowa was when she targeted their Republican Governor, Terry Branstad, saying that she wouldn’t want him running her health care. This might work very well for the primary, but it probably won’t pay off in terms of winning Iowa in the general election given that Branstad has been reelected so many times in Iowa that he is now on track to be the longest-serving governor in American history. The other observation was that not a single candidate ran an ad during the entire debate. Maybe that’s because they figured they had enough time during the debate to get their points across, but it seems weird to me that they would unilaterally disarm over the airwaves and run the risk of their opponents running completely over them. However, it’s also possible that they weren’t allowed to run ads during the debate. Right before the debate, there were plenty of ads for candidates, with even Ben Carson having an ad. In fact, there were five ads I saw in a row for candidates or political causes right before the debate. That basically sums up everything that I saw in Iowa that I thought might not have been apparent to those watching from out-of-state. If I missed something let me know!